This example shows how to create an atmosphere shader with volumetric shadows. The atmosphere object has a vex lit fog shader attached to it, and the spotlight has deep shadows enabled. The objects in the scene have a matte shader attached to them. This is an example file showing an object made up of two quads, one with a bump map, the other with true displacement. This object is duplicated, and the second copy uses a style sheet to reverse the material assignments on the two quads. In this file we create a simple geometry and assign BxDF shaders to it. The shading network consists of pattern shaders feeding into the BxDF shaders. This example shows how to render an isosurface defined by a cvex shader using mantra’s volume rendering capabilities. 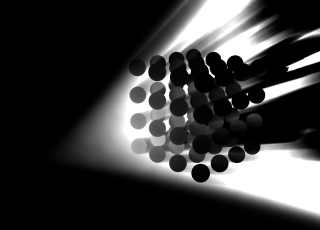 A noise field is generated by a cvex shader, which is attached to the VEX Volume Procedural. The volume is shaded by finding the surface where the density crosses 0, and then shading using a simple surface shader that shows the normals.